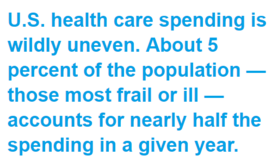 What is the solution to achieving affordable hospital and health–related insurance costs? Private industry and freedom of choice? Government–mandated coverage that covers everyone equally? Is it a combination of the two, or is there a solution yet to be considered? The single most important and unaddressed issue to reducing healthcare-related costs lies in our fundamentally free enterprise system based on choice and cost comparisons by the buyer. We, as consumers, are entitled to choose health-related services, goods, or supplies based on cost just as we do when purchasing a home, a vehicle, clothing, groceries, or any other goods or services. Through the 50s, 60s, 70s, and early 80s it was common to know what medical costs were prior to the service. Why did this stop? HMOs made it easy to not care about the final price tag. Because health services during this time were so inexpensive, we no longer needed to invest our valuable time in cost-related issues – “Hey, it’s just a $5.00 copay! Nothing else to think about!” – and we, unknowingly, allowed health care costs to balloon out of control. Without question, “price transparency” of all medical care, services, and supplies in an instantly-comparative format, is the most important component to reducing healthcare costs through competitive pricing and ultimate long-term cost control. How complicated would it be for the government to require all providers of medical care, services, and supplies to publish the price of their service or goods on a website provided by private industry or the government to give “the people” the control we need in order to make an informed buying decision? Our inability to compare costs prior to purchase over the past 25 or more years, thanks to HMOs, have allowed independent insurance providers to excessively profit from our inability to source and compare pricing while we remain hostage to a lack of transparency and no freedom to pursue more affordable options. Let’s consider “We the People” and our needs. Fact – we do not all need the same care or coverage. Fact – we will not all use the same care or coverage. Fact – we do not all currently suffer from health conditions. Fact – we do not all require frequent hospitalization. Fact – we do not all need or take prescription drugs. Then why are we being required to purchase this bright, shiny, overpriced Cadillac called the Affordable Care Act that comes with a huge deductible most of us can’t meet? Maybe one person’s plan does not need to cover everything another person’s plan needs to cover? Maybe a $0 or low–deductible hospital, surgical, critical illness private medical insurance plan with the enhanced value of PPO savings would better suit one’s needs and budget? Maybe saving hundreds or even thousands per year makes better financial sense? Our independent insurance agents are dedicated to finding you and your loved ones a plan that will provide suitable coverage at affordable costs. Let’s find an affordable healthcare plan for you today. Click below for your alternative health care quote.